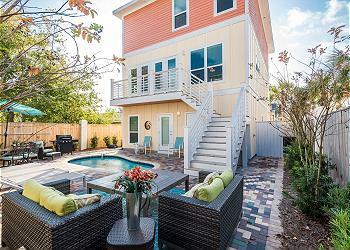 DETAILS: Drift into your relaxing Destin getaway in this “Costa Cabana”! This beachfront home features 4 bedrooms, 2 bathrooms, beautiful emerald coast and harbor views, and wonderful accommodations for 12 guests! A welcoming and coastal vibe greets guests inside the home’s first floor. On this level, guests will enjoy the secondary living area, complete with plush furnishings, a fireplace, and a mounted, flat-screen television. Two beautifully appointed bunk rooms each offer two sets of twin-over-twin bunk beds. The third bedroom on this level is a gorgeous king bed guestroom, which offers a mounted flat-screen television and beautiful coastal dune views and walk-out access to the home’s lower-level outdoor area. Guests on this level can access a shared bathroom with a shower/tub combo. The home’s second level boasts a spacious floorplan. Vaulted ceilings, transom windows, and sliding-glass doors invite ample natural light into the space and give this area a bright and refreshing ambiance. A comfortable sofa and multiple armchairs beckon guests to unwind in the serene living room. Granite countertops and stainless steel appliances make the kitchen a wonderful place to prepare family meals, and ample seating at the breakfast bar and spacious dining table welcomes everyone to share a lovely meal at home. Spacious porches on the second level offer guests beautiful harbor views from the front of the home and exquisite coastal views and outdoor seating/dining options on the back of the home. Guests in the luxurious master suite can porch access and coastal views from their room, which boasts a lavish king bed and a private en suite bathroom with a shower/tub combo. Beachfront access ensures guests in this gorgeous property will have plenty of opportunity to sink their toes in the sugar white sand and splash in the sparkling emerald waters. Four custom 360 Blue adult beachcruiser bikes provide a wonderful way to explore Destin on a breezy bike ride. Dining and shopping options abound in Destin, and just down the road along Scenic Highway 30A are the most charming beach towns, which are sure to offer incredible local restaurants, shopping, and entertainment. 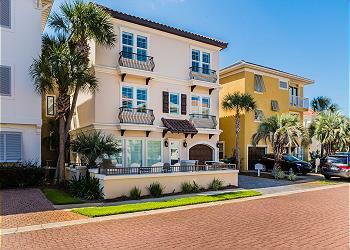 Your dream beachfront Destin getaway is almost set. Contact 360 Blue today to book this incredible home and to plan you next coastal getaway! Staying here was absolutely amazing! I love the decor, the layout and the feeling of the home. The views were great and my kids loved the fact that they could go around on the deck. We had views of the marina in the front and the beach in the back. The house was very clean and organized, the beds were comfortable and the house slept 12 of us comfortably. The location is perfect and close to everything. I will definitely stay here again when visiting Destin. You cannot beat the views from this gorgeous home! We are so excited you and your family had such a great vacation in Destin! Thank you for choosing to stay with 360 Blue and we hope to have you back soon!